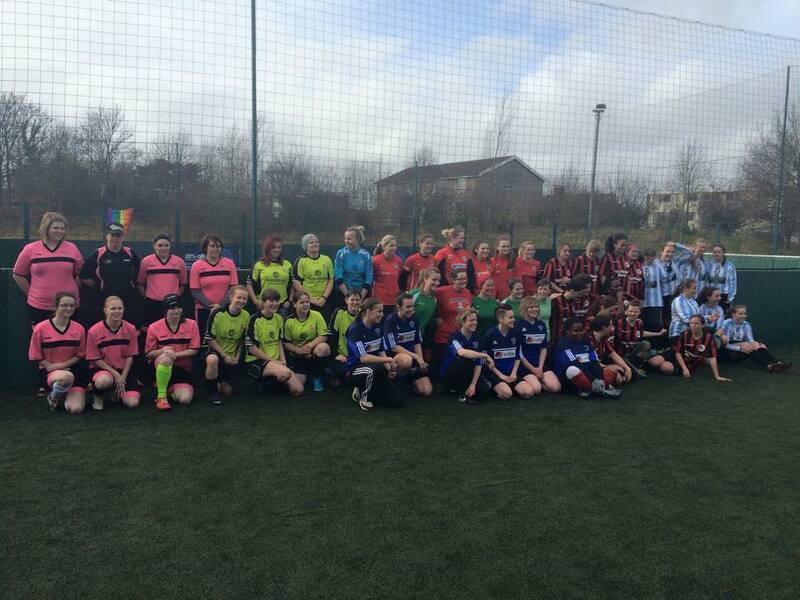 8 women’s teams, one venue, one purpose – to show our support for the Football v Homophobia campaign. 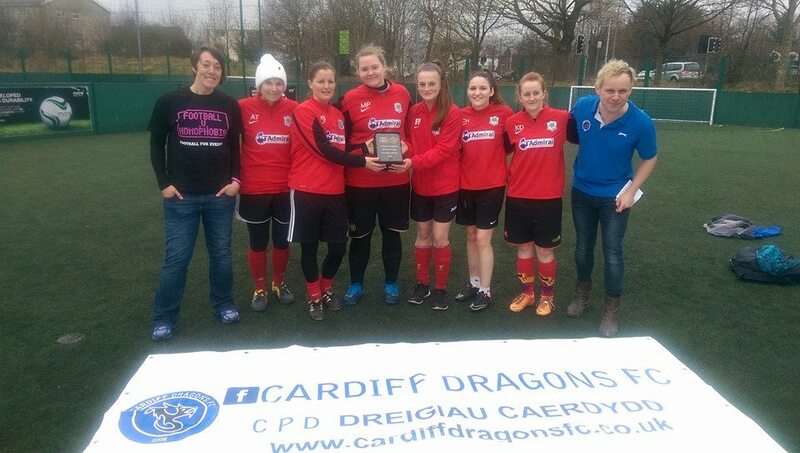 The Dragons were proud to support the FvH campaign by running a 5-a-side tournament at PowerLeague in Cardiff on Saturday 28th March. 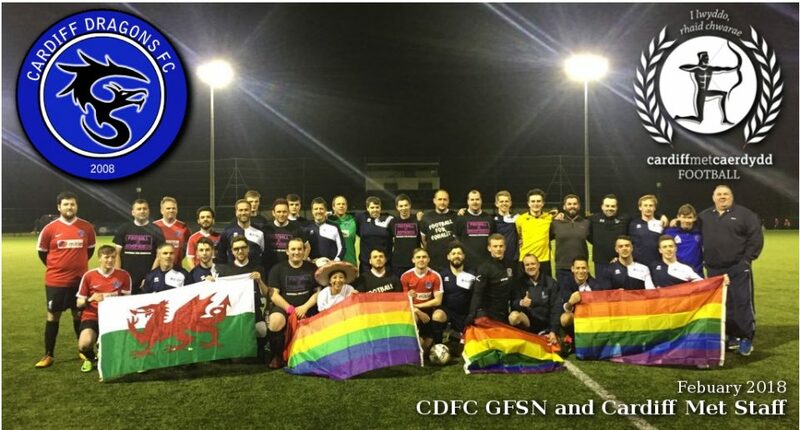 Being Wales’ only LGBT football club, we were proud to receive a grant from the FvH campaign to run our event and invite teams from across South Wales and beyond. With 8 women’s teams signed up, we ran two groups with an FvH slate plaque competition for the top two of each group and a vase competition for the bottom two in each group. 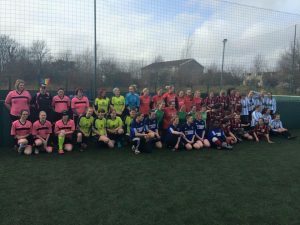 The group matches were hotly contested and we were really pleased to welcome a range of teams which included the Easton Cowgirls from Bristol, Rock Solid from Cardiff, Vale of Glamorgan Ladies, Cyncoed Ladies, Hafod Ladies and Street Football Wales Ladies. 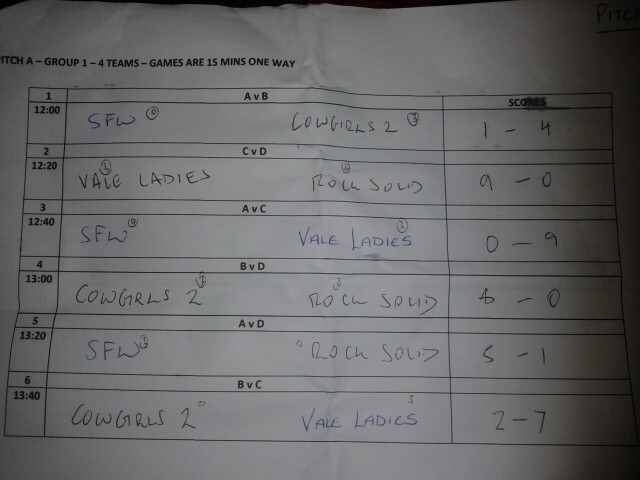 Cyncoed and Vale emerged as two clear favourites as they increased their goal tally with each game. 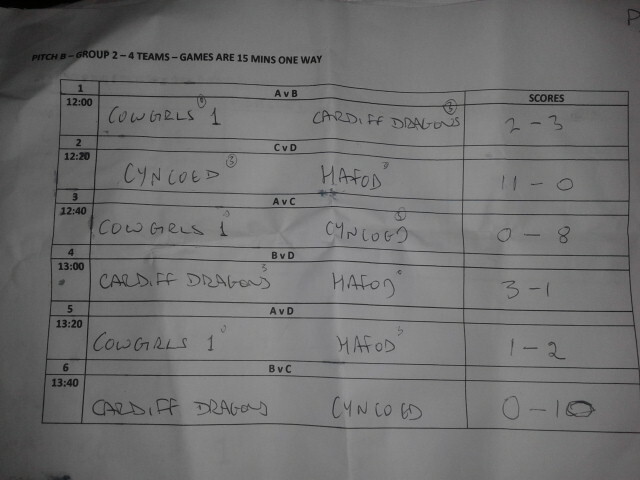 The hosts of the tournament, Cardiff Dragons started really well with two group wins. So into the Vase competition went Street Football Wales v Easton Cowgirls 1 in the first semi-final with the Cowgirls booking their place in the Vase final with a close 2-0 victory. 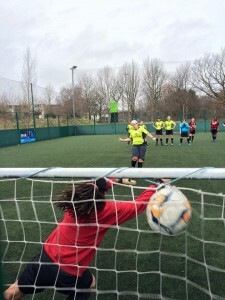 In the second semi-final Hafod Ladies put 7 goals past Rock Solid and also booked their place in the final. 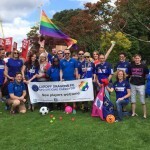 It was a closely fought game with both teams finishing 4-4 – Cowgirls nicked a last minute goal which meant that the teams went into penalties to decide the winner of the huge Vase. Well done to Cowgirls who won on penalties 3-2!! The FvH plaque semi finals started with Vale Ladies v Cardiff Dragons. Vale were really strong in their group and despite the Dragons scoring 4 great goals, Vale Ladies came out on top 8-4. A special mention here goes to Dragon of the Day, Megan who gave an outstanding performance in goal! 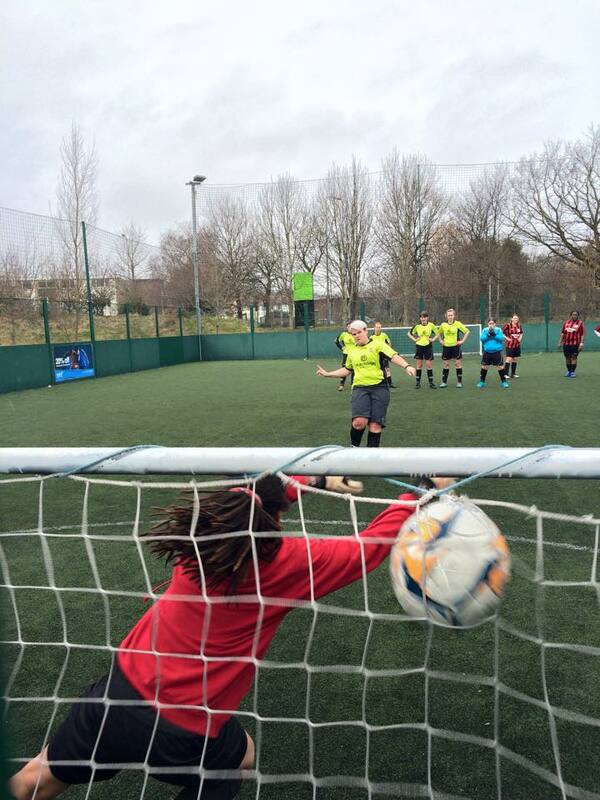 The second semi was the favourites, Cyncoed vs Easton Cowgirls 2. Unfortunately, Cyncoed got the better of the Cowgirls and stormed away with an 8-0 victory to book their place in the final. It was clear early on that these two teams would probably meet each other in the final. Both teams scored a huge amount of goals in the group stages and played some clinical football. However, Cyncoed proved to be the stronger outfit with a convincing 9-1 win over a young Vale side. The event was a great team effort with the Dragons Committee mucking in with various tasks to make it happen. Special thanks to Tesco (courtesy of Jason C) for supplying water and fruit and to PowerLeague for supplying the biggest trophy ever. The winner’s slate plaque was produced by a Welsh company called Lasers R Us who we highly recommend for unique awards. Thanks to all who gave up their Saturday afternoon to take part and to come along and support!